I can see how the algorithm detects cycle in O(n) time. However, I am unable to visualise the fact that once the tortoise and hare pointers meet for the first time, the start of the cycle can be determined by moving tortoise pointer back to start and then moving both tortoise and hare one step at a time. The point where they first meet is the start of the cycle. Can someone help by providing an explanation, hopefully different from the one on wikipedia, as I am unable to understand/visualise it? Hence by moving slowPointer to start of linked list, and making both slowPointer and fastPointer to move one node at a time, they both have same distance to cover. They will reach at the point where the loop starts in the linked list. $x = z$ (which is obviously wrong, and the diagram just makes it seem plausible due to the way it is sketched). The above equation proves that $x$ is the same as some multiple of loop length, $L$ minus $y$. 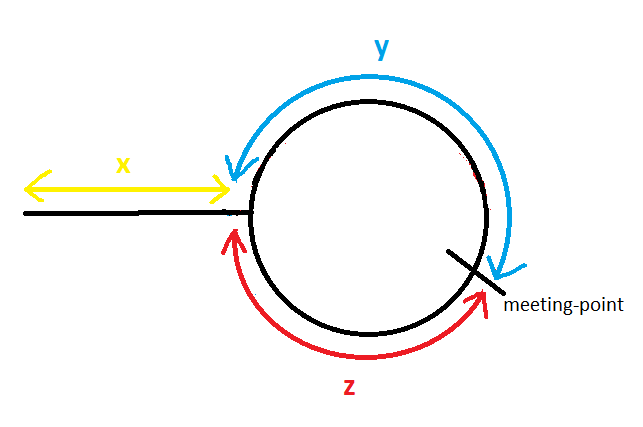 So, if the fast pointer starts at the meeting point, $M$ or at $x + y$, then it will end up at the start of the loop. I found the answer on stackoverflow. Thanks if anyone was looking into this for me. And for those who like me wanted an explanation, please refer to: https://stackoverflow.com/questions/3952805/proof-of-detecting-the-start-of-cycle-in-linked-list The chosen answer to the question, explains it! Not the answer you're looking for? Browse other questions tagged algorithms linked-lists or ask your own question. Why is Brent's Cycle Detection method faster at finding a Linked List cycle than Floyd's Cycle Detection method? What is the best algorithm to compute ALL homomorphisms between two rooted labeled trees? Efficient method to compute weighted Jaccard similarity? Did Menezes et al. switch the letters $\mu$ and $\lambda$ in Floyd's cycle detection note 3.8?